Waxing Phases favor actions involving planting anew and moving forward, as energy increases throughout one half of your Zodiac Pie from 28 degrees Leo through Virgo, Libra, Scorpio, Sagittarius, Capricorn and Aquarius until the next Full Moon at 13 degrees Pisces 06 September 2017. This third New Moon of Summer (and second within Leo) -whose impact is long lasting- seeks for us to be well aware of expecting the unexpected to bring forward radical new beginnings within our lives. Equally we are called to be ultimately responsible to what is starting from where The Lion asks for our loyalty and to be careful in matters of trust concerning it. Should we choose to deny our accountability, we will experience chaotic outcomes that otherwise could be avoided. As we recognize we are the only ones in charge of what we are able to manifest, we are completely able to navigate our new opportunities with success. Our third New Moon of Summer 2017 is coupled with a Total Solar Eclipse, packing an energetic punch that outlasts the normal waxing phase for 6 months up to a years time, indicating what is naturally meant to begin from this area of the life has true staying power for the long term. *This waxing phases aligns in equal reflection requests from Mercury Retrograde that transits 12 August to 05 September. * Remember with the beginnings we will naturally see from the potency of the Solar Eclipse, we need to apply careful attention and ultimate awareness concerning anything we truly choose to start under Mercury Retrograde. Your children or brain-children completely capture your attention, as creative adventures really have you feeling something is powerfully flourishing with them. A personal responsibility to work with the reinvention in play for your approaches to life aligns you in truth for directions your future will take. New life flows within your home and family life, and if déjà vu finds you, listen carefully to it. As your closest environments ask for intent focus, take necessary time alone to process what is revealed to you in solitude. Honor this, and transformations for your career are primed to shine moving forward. Brainstorms welcome absolute excitement for your state of mind, and how you are meant to work with refreshing ideas. As surprises equally arrive to allow your future goals and social scenes to go in different directions, equally be more than willing to align your partnerships in a friendly new truth. Value opens new doors as increases to your earning power and security are ready to commence. The reinvention in play for your career gets kicked up another notch as more breakthroughs are revealed, working further with responsibility to your habits and routines, granting more rebirth to your wealth. The world is ready for your appearance to change, as your emerging self and approaches to life intensely align you in the mantra “if it is new it is for you.” As regeneration presses on for your philosophies, beliefs and sense of truth, take creative stability to your partnerships and find balance you can rely upon. Intuitive answers arrive by honoring your solitude and inner work. Note any messages dreams contain for your waking life. As rebirth reshapes your entire scope of life in more than astonishing ways, your home life seeks for you to work with different habits and routines to unlock your ultimate success. Initiating energy excites your future goals along with your hopes, wishes, new friends, organizations and groups. Accept invitations to mix and mingle, as amazing opportunities are presented to you. Expect the unexpected within your partnerships, utilize patience in your communications and witness your creative rewards blossom. As your career is poised to receive recognition and reward, your public life is ready for more responsibility. Habitually, surprising turns change up your routines as your service to self and others as serious ways for you to value life works with life at home seeks so harmony and balance can find it. Your philosophies experience intense changes, as education & spiritual pursuits find you journeying afar for the truth, as you gravely recognize you are a student once again. As erratic energy circulates around your children and creative nature utilize your patience to allow peace of mind to keep you calm. Regenerative energies in full play ask you to embrace an intense rebirth concerning your overall state of wealth and sexuality. Your source energy absolutely knows that there is no going back, provoking more reinvention for your home life as you take time alone to ponder ways your earning power can find more security. New agreements are favored within your business or personal relationships as well as legal matters. Be especially on alert to break-through ideas coming out of no where concerning them, for these are important to capture, assisting you to align future goals in peaceful outcomes for harmonious new approaches to your life. New beginnings activate your ability to serve others, your health, habits and routines with positive changes. You’ll find there are even more unusual and innovative ways your earning power and overall value for your security shifts, involving attention upon your career granting pleasing news for your wealth. TIME to bring all anew to the area of life where The Lion reigns in your Zodiac Pie! A fresh start in Leo promises generous and confident energies you definitely don’t want to miss-out on. As we are soon to complete the shadow of Mercury Retrograde that recently asked you to make the ultimate space for a slew of “if it is new it is for you” here, it’s time to move forward. 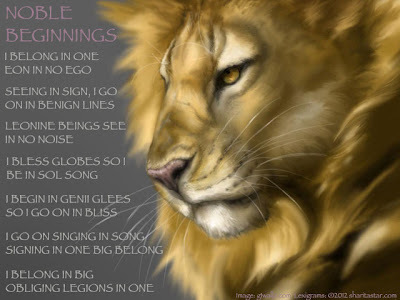 What are you best to focus upon where Leo bestows nobility and benevolence in your life? Leo Lunar energy must beware of conceited, self-indulgent, and opinionated energies that may arise. When there is plenty of magnanimous leadership around, it sure can be easy to gravitate to not being able to recognize limitations. While a strong sense of pleasure-loving and dramatization mark any planetary passage through The Lion, the cultivation of humility, altruism, thrift, and attention to detail will allow this transit to reap its’ greatest rewards. As our Moon and Sun align once more, a fresh start in Leo brings forth passionate and heartfelt feelings as our Lunar light joins to rule the forest with The Lion. As another waxing phase begins, it’s time to get those new ideas and initiations out there to gather in the light. When our New Moon embarks in the dignified energies of Leo -the sign that consciously aims for creative self-expression- the collective is primed to tap into some inspiration and faith. 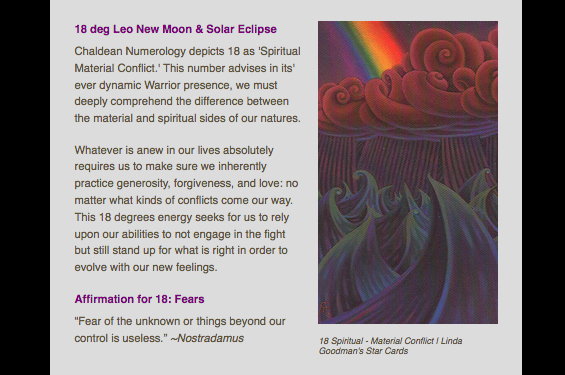 Fire is Leo’s elemental influence, so be alert to the radiating gifts that are meant to unfold- as this New Moon kicks off an loyal and vital force that The Lion and Lioness wish to share with the world. If you’ve done your soul’s homework, you are so ready for what is coming anew to this area of your life. As the shadow of Mercury’s Retrograde in Leo passage 14 July to 08 August concludes 21 August, you have carte blanche to take up with all of the excitement as everyone of our planets will be moving forward for awhile. It was always said that 2012 would be a year of change, but it will come clearer that we have seemingly waited until this point in the year to see the genuine opportunities for life down here below to unfold without a little cautionary pause from above. There is a true spiritual request streaming from the 25 degree Leo kick-off point, which will be more than happy for you to be extra keen to the observation of what all the details are in the new beginnings which will be happy to find you. What will equally be an exceptional assistant is glancing over to the Libra area of the life, where Mars and Saturn will sextile our New Moon at 24 and 26 degrees Libra respectfully. This receptive fire (Leo) and air (Libra) relation opens up a tremendous flow to what may have been in a sense of restriction from Saturn’s karmic requests within The Scales since 2010. Now, as Mars motivates action and Saturn gets ready to soon journey with Scorpio, if you’ve been responsible here, now, get ready to reap the rewards from your acts of patience. For the collective horoscope, again we offer some simple advice for every sign from the outer vantage point. Remember, if you know your Rising Sign (Ascendant), read that passage too, for it typically will apply to your personal charts’ advice. Be sure to check the Leo House, in particular where the 25-degree Leo spot in your natal birth chart lives. (A natal birth chart is determined from the time of birth, which allows a more in-depth look to equally see where some pondering is ideally meant to unfold in how the planets uniquely affect you.) Whether the collective or individual vantage point, these are the areas of life that call for you to bring forth initiation within the next two weeks to follow. Properly planting in these areas until the next Full Moon upon 31 August will put in place the necessary seeds to see growth to follow from later on. Aries: Rams, it’s totally time for you to get out on your stage to shine and play! Focusing upon where “I Create” -whether a new brainchild or your physical offspring- is where you should be pioneering. A love affair flirts with you, which is easily able to move on to a relationship level if you are willing to entertain it. Remember all that heart’s reflection you just went through, and you will make the proper choices about where your loyalties are meant to plant their new seeds. Taurus: There are a many new things now ready to get grounded that pertain to your home and family life where “I Nurture.” This passage marks a time to bring new heartfelt feelings to where you feel most secure and loved. As you look to your new environments, you will also see easy ways you can relate to how your serve the world and handle your health routines. That sense of déjà vu says listen to that instinct you hear, as its’ message is of karmic importance. Gemini: You’re always thinking and catching thoughts from any direction, yet be ready for some truly inspiring ones to find you now were “I Communicate.” The mental state will be feeling entirely fresh as a daisy as your optimism should be especially filled with magic. Unite this with all the creative motivation in action for you at present and presto: you will have been responsible to the request to find a new and stable way that will have you feeling wise as well about it all. Cancer: Ok Dear Crab, you should be feeling better about what “I Have” as new opportunities are here to bring back that earning power after the recent review. Your value system and sense of security are ready to fly, so take focus. Give a hearty look at your possessions, and see what really means the most to you, as there may be some necessary new purchases you are about to make, but make sure they are responsible and necessary ones when it comes to the home. Leo: The Lion always loves to be on the stage, and your whole approach to “I Am” is ready to put on that new mask and roar! You’ve made the space for those first impressions to change, and the world is amazed by the new you! Humility allows you to gain the real insight you seek, as it lets you see through the entire forest you have reign over. If you have been communicating responsibly and courageously, be ready for a hearty reward to turn your thoughts into gold. Virgo: Logic doesn’t serve you now Dear Virgin. Those fresh energies emerging with the inner layers of your psyche, the unknown, where “I Process” are ready to move forward. You were a good student and did your soul’s homework here under Mercury’s request to pay attention to the most hidden parts of yourself, weren’t you? Dreams continue to be a remarkable tool- study and review these well. Clues come easily about how to stop worrying about what you already have. Libra: There is a buzz of energy in your friendships and organizations, where “I Socialize.” While you have definitely been feeling your personal re-balancing acts going on lately, now is the time to go for that unexpected social invitation- so get out there and relate to it all. New groups, hopes, wishes and dreams are ready to be started. As Father Time soon will leave your sign, recognize how much motivation has found you lately to create a fresh, new and wiser you. Scorpio: Career matters and the public life are on the surface right now, and decisions need to be made on where it is all going where “I Structure.” Your purpose, mission, and reputation all are awaiting significant changes, so if something different shows up, you already know you made the room for it. While power is always around you, your take on authority looks different, which speaks to you strongly from the realms of your innate subconscious, motivated by a dream. Sagittarius: You’ll find fortunate aims your arrows can take towards gaining more of that philosophy you love so much Archer where “I Believe.” Embark on or make plans for a new adventure. You always find ways to travel, but make sure the next one places you in pursuit of something that takes your spirit to the realms of higher education. You love change, and you’ll find there is a responsible group or friends around who will wish to help you initiate accordingly. Capricorn: Been patiently waiting to make those financial moves old Goat? It’s a prominent time to take a look at investments, shared/joint resources, all where “I Transform.” Looking for more intimacy in a personal relationship? On a physical level you may be finding yourself not thinking about all that work to be done. As your core is regenerating in new and fabulous ways, that work should become more enjoyable and see the kinds of action you like to ambitiously climb in. Aquarius: Now is not the time to be detached, but to look to yourself to see how to bring new life to all of your partnerships in life where “I Relate.” There should be plenty of space here for you at present after all the recent Mercury review, and now the warmth can be felt again. Heartfelt energy feeds your one-on-one bonds to creatively grow. If you’ve been responsible to the courage that is streaming from your beliefs, your spiritual relationships are ready to soar. Pisces: If you listened to your intuition, you have already started to bring improvements your routine, personal habits, health and where “I Serve.” Mercury’s reflective pass made the space for the new here, and these definite changes deal with your ability to be of service to the world- there are now fresh and very clean waters you are meant to be swimming in. The depths of the core transformations you’ve been in for the past two years now feel their finest rebirth.